On this day (August. 13th) in 1975: Bruce Springsteen & The E Street Band performed the first of five sold-out nights at New York City’s Bottom Line; the Greenwich Village music club had a capacity of only 400/500…The ten-show stand at the Bottom Line early in the (Born to Run) tour remains a rock date to rival James Brown at the Apollo or Dylan at Newport. At the Bottom Line, Springsteen became himself. By adding Stevie Van Zandt as a second guitar player, he was liberated from some of his musical duties, and he became a full-throttle front man, leaping off amps and pianos, frog-hopping from one tabletop to the next. 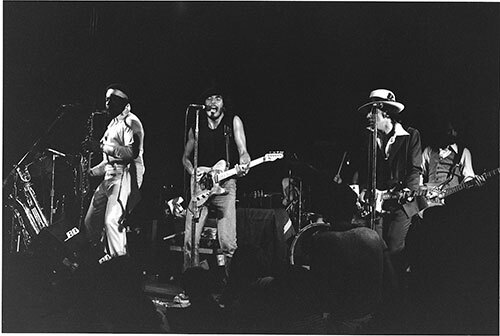 On August 13th, 1975, it was twelve days before the release of Born To Run, Bruce Springsteen and the E Street Band began their five night, ten show stand at The Bottom Line. With two shows each night an early and a late set, This was a new E Street Band, with keyboardist Roy Bittan and drummer Max Weinberg replacing David Sancious and Ernest “Boom” Carter, respectively. Steven Van Zandt, who’d played in an earlier band with Springsteen, joined as a second guitarist. Columbia Records executives were frustrated by Springsteen’s lack of success. They purchased a quarter of the tickets at the 500 seat venue and distributed them to music industry types to get the word out. Even so, not all of the shows were sold out until after WNEW-FM broadcast the fifth show. After that, people were lined up around the block to get in. Robert De Niro, was in New York shooting Taxi Driver, he caught one of the Bottom Line shows. He watched as the crowd yelled “Brruuuuuuce!” and Springsteen responded with “You talkin’ to me?”. De Niro would make that line his own in an improvised scene shot within the next couple of days. In August 1975, Bruce Springsteen and The E Street Band performed a 5-night stand at Bottom Line in New York City, NY, from 13 to 17 Aug 1975. They played two shows each night, an early one at 8:30 p.m. and a late one at 11:30 p.m. All ten shows were sold-out. The early 15th August 1975 show was broadcast live by New York’s WNEW-FM. “The story of Bruce’s early days has been documented many times, most recently in the current New Yorker magazine. As described therein, Bruce’s five night, ten show stint at The Bottom Line was crucial to launching his third album, “Born to Run”. Many executives at Columbia Records were frustrated with Bruce’s lack of commercial success and Born to Run was likely his last chance with the label. Columbia reportedly bought a quarter of the 500 seats for each show to distribute among music industry people . Even so, tickets did not sell out immediately and a week after going on sale they were available for any of the shows. That all ended when the public heard WNEW’s broadcast of show number 5. The next two nights, fans were lined up around the corner with the hope of getting a standing room spot at the bar to hear the new phenomenen. This sound source has some crackling, and sound does fade in and out a bit here and there, because this source was recorded off the radio broadcast, but it is sourced from a master tape of the show, not the vinyl record source. So there are a few tape cuts between songs, and a few times the source sound varies, but overall a very, very nice recording. Bruce Springsteen & The E Street Band – “The E Street Shuffle” Live on 8/15/1975 at the Bottom Line in New York City, Recorded during the early show (of two that night) on 15th Aug.-1975. The Bottom Line club only held 400 people, and it was unique in that it had seating rather than standing room only.This made for a small and intimate atmosphere between the audience and performer. The E-Street band at this time was: Clarence Clemons-sax, Garry Tallent-bass guitar, Roy Bittan-piano, Danny Federici-organ/accordion, Max Weinberg-drums, Steve Van Zandt-guitars, and Bruce. Max Weinberg and Steve Van Zant, both had only been in the band less than a year, joining in September.-1974 and March-1975 respectively. This was clearly the start of Bruce’s fame, and these shows are legendary. Rolling Stone magazine listed this run of shows as one of the top-ten defining moments in rock and roll history, right up there in “the top ten” along with: Elvis at Sun Studio 1954, Rolling Stones 1971 Exile on Main St. summer, Dylan going electric in 1965, ect. The Boss and the band put everything they had into these shows, and it shows…..despite being early Springsteen, the charisma and dynamic intensity is obvious. After these shows, Springsteen and the E Street Band became a mighty force to be reckonned within the rock and roll industry. They were no longer just the “opening act” but headliners selling out arenas and large concert halls. After this run at the Bottom Line, gone were the days of playing small clubs like the Student Prince, the Stone Pony, the Main Point. Now Bruce was going to be headlining such places as the Spectrum, Madison Square Gardens, Hammersmith Odeon, Boston Gardens, LA Forum. If you couple this with his show at the Main Point club on 05th Feb.-1975, this was the beginning of the Springsteen wave of popularity, and the point of no return for Bruce and the band. A month later after this run of shows, Springsteen made the cover of both Time and Newsweek magazines in the same week. 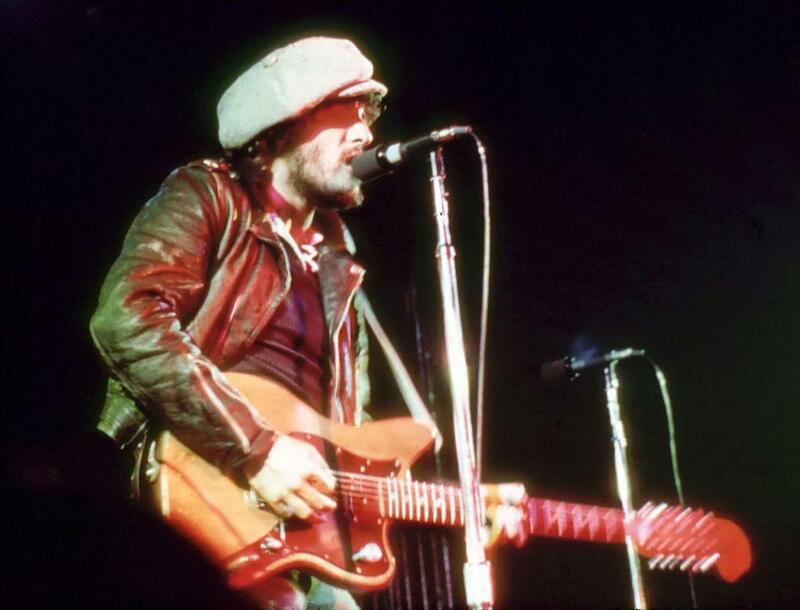 These performances are among the best early Springsteen I have ever heard, This show, along with the Main Point show of 05th Feb.-1975 are incredible considering Springsteen was only 25-years old at the time. He had come a long way in 3-years since auditioning for John Hammond Sr. in May 1972. As John Hammond Sr. put it: “When Dylan came to me to audition, he was simply Robert Zimmerman. But when Bruce came to me, he was already Bruce Springsteen, he was already a Superstar on his way….he was much further developed….everyone just knew he was going to be huge.” To be sure, there would be the future legendary Darkness On The Edge Of Town tour shows in 1978, but up until that time, there would be no finer Springsteen performances than this run of shows at the Bottom Line. Between song banter has been edited a bit, but Bruce and the band do have some very funny comments. Songs are complete, and band performance is top notch. Springsteen and his lawyers went all out to prevent sale of the vinyl record way back in 1976 threatening lawsuits against distribution. This was because Springsteen had recorded several of the Bottom Line shows for a possible official live album release. So Springsteen decided to release a live album officially, with performances culled from the run of live shows at the Bottom Line club during August 1975.but these are on the source tape, not taken from a vinyl transfer. There is a complete CD set of the entire broadcast that includes complete between song banter, radio DJ comments, ect. is called: “The Punk Meets The Godfather” on Godfather CD’s. At the early show, “Thunder Road” is performed in the slow version with Roy on piano and Bruce on harmonica and vocals. “Rosalita Come Out Tonight” includes a snippet of “Theme From Shaft” in the midsection. At the late show, “For You” is performed solo piano and “Thunder Road” is performed full band. The setlist would also include the only known 1975 performance of the rhythm and blues standard “(Get Your Kicks On) Route 66”. There are rumors that at least one of the Bottom Line shows was professionally filmed by Bruce, possibly parts of other Bottom Line shows also. Film footage is rumored to be hi-quality color, pro-shot with several cameras, and is a complete performance. Legend has it that this film footage is considered to be “superb” by the Springsteen band, and was a serious contender for inclusion with the 30th Anniversary release of the Born To Run box set. Soulfire Live! is an epic and electrifying journey through rock ‘n’ roll history led by one of its most passionate practitioners, showcasing Stevie Van Zandt’s limitless knowledge, talent, and sheer love for the genre in all its many shapes and guises. Among the album’s many highlights is the introduction made by the legendary Mike Stoller, who along with partner Jerry Leiber, are widely considered to be the first successful and the most enduring rock songwriters and producers of all time. Other highlights on the album are the original songs from throughout Little Steven’s illustrious career – including classics like “Standing In The Line Of Fire” and “I Don’t Want To Go Home” alongside a number of favorite cover versions like The Electric Flag’s “Groovin’ Is Easy,” Etta James’ “Blues Is My Business,” and James Brown’s “Down And Out In New York City,” the latter two songs also featured on last year’s critically acclaimed Soulfire. In addition Soulfire Live!, includes Van Zandt’s inimitable introductions, detailing each song’s unique history and singular spot in his life and illustrious career. Little Steven (aka Steven Van Zandt) and his powerful 14-piece band The Disciples of Soul performing live around the world! Includes guest appearances from Bruce Springsteen, Richie Sambora, Peter Wolf, and Jerry Miller!